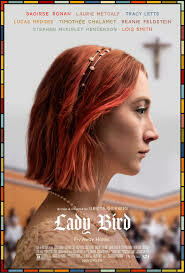 Lady Bird is the story of a teen, Saoirse Ronan (Brooklyn 2015) as (Christine ‘Lady Bird’ McPherson). The setting is Sacramento, California in 2002, the hometown of the film’s writer/director Greta Gerwig. It portrays the mother-daughter relationship between Christine “Lady Bird” McPherson and her mother Laurie Metcalf as Marion McPherson. A genuine coming-of-age story, filled with snapshots of the tender shift from the teenage years to adulthood. Gerwig herself has termed the film ‘a love letter to Sacramento’ where incidentally she grew up. Her directorial debut bursts onscreen with a strong script and outstanding performances to back it up. Much of the films’ narrative reminded me of another outstanding script, Manchester By the Sea. The dialogue is filled with authentic nuances with everyday life clichés, which in turn allows us to care about the characters and to truly know them. From the beginning until the credits role, you’ll experience a family dynamic that gives us the struggles and the triumphs—while adding comedic moments in all the right places. The Bottom-Line? An enduring film with so much to rave about! Oscar-worthy performances, outstanding direction, great script (so real, raw and emotional) along with tremendous editing; definitely my kind of film! Credits: Directed and written by Greta Gerwig.